However some of these rules have outlived their usefulness and have now become totally redundant. It is now time to become a marshmallow from a kitkat and do away with these good for nothing and pointless rules. I love black and blue and personally feel that this rule is stupid. I can not imagine what prompted this rule to come into existence even when it did. Nothing ever looks bad with black. Black and brown especially brown in the tan hues looks really classy and nothing looks sexier than a well fitted pair of blue jeans with a black button down shirt. Casual, cool, relaxed but stylish. Now this rule I understand. This was issued for keeping beginners from goofing up. Black and blue are safe choices and you have to try really hard and be a real nincompoop when it comes to fashion to mess these iconic colors. But this rule does not apply once you have learnt the ropes. Black and navy is a great start but there are other hues too, which work just as well to create a lasting impression like grey, tan, and brown. In fact pink, yellow and green work too, when picked in the right hues and coordinated well. You do not need to take the plunge right away. Start small. Like with just the shirt or the pants or the tie or the jacket or sweater. I, for one swear by this rule especially for novices. Loyal readers will know that I always advice people to match their shoes with their belt, not only with respect to the color but also the texture. However there are some exceptions to this rule. If they coordinate well or are complimentary colors then you can go for it. Some colors and textures are hard to match, hence in such cases you should make sure that at least they do not clash with each other. This was a big no no back in the day. Most stylists still adhere to this rule as people really need to put some thought and effort when missing patterns. It is not something you decide to wear at the last minute, when you are getting late and need to get dressed in just 20 minutes. Start small. Mix patterns but in moderation. A good idea would be to pick different patterns but from the same color palette or color family. Try different combinations before zeroing in on any option. And remember, something like this is going to attract attention, so be confident. Do not try something like this if you feel awkward in the limelight. Now this is true even today but when you wear something which is very tight, this can easily be avoided, or something that covers you from head to toe in horizontal stripes, which, to be very honest, is not a very likely scenario. 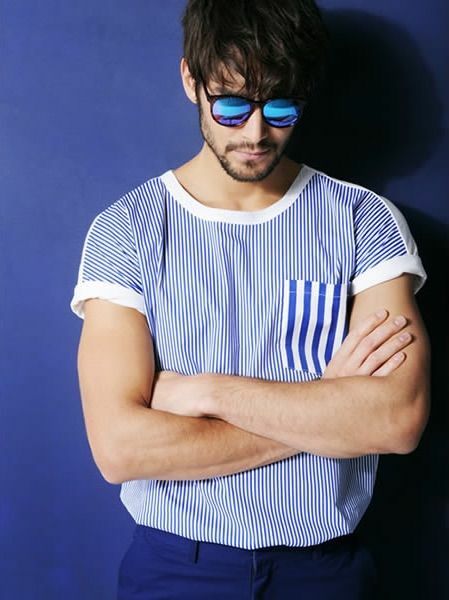 A stripped tee, a horizontal striped t-shirt that is, in a regular or a little loose fit will not make you look wider. Maybe people could not pull it off back then but they sure as hell can today. The important thing to remember is not to go overboard with your love for denim and commit the sin of wearing denim jeans with denim shirt and denim jacket all in one go. Pace yourself and learn to color coordinate the dark and light shades of denims. 10 Men’s Fashion Mistakes to avoid in 2017 !